We’re all looking for ways to trim the budget. 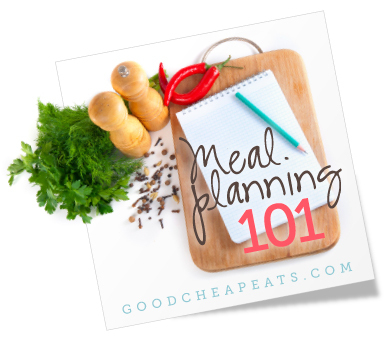 Meal planning and working around sales are great ways to save money. Food keeps us alive. Cheap meals keep us solvent. Good cheap eats keep us happy. And really, that is the order of the day. We don’t need great food to live, but it sure makes the journey a lot more enjoyable. Staying solvent? Well, that’s pretty cool. I learned that the hard way. When we first looked at our debt straight in the face — circa 2007 — it was pretty humbling. In the months leading up to our wake-up call, I’d been buying whatever I wanted at the store. We lived in Kansas City, a climate really different than my native California. We were hosting regular church get-togethers at our home, prompting me to justify spending excess at the store. And I had gotten the idea that we should eat healthier, so I was paying whatever it cost to buy expensive, organic food items at a time when and a locale where it wasn’t easily or cheaply procured. I don’t blame my circumstances for getting me in debt. I blame me. I had thrown caution to the wind in order to make myself feel more comfortable in a crazy season of life. When I woke up and saw what I had done, it was time to get to business. We had a serious money meeting, agreed not to use our credit cards, and proceeded to cut every possible expense that we could. That first month, we ate up almost every last crumb in the house and spent just a few hundred dollars that month on groceries. By necessity I reclaimed the things that I already knew about thrifty living and started to get serious. And that meant planning our meals very carefully. Every meal mattered. I needed to stretch our dollars as far as humanly possible. And yet, I knew food was a comfort. We were discouraged living so far from home. We were bereft at being such poor stewards of our money. What we wanted/needed was a nightly dose of comfort and here we were with a bare bones food budget. One of the things that helped us bridge that gap was learning — or relearning, as the case may be — how to shop the sales. If you find yourself in a similar situation, or simply want to free up resources for other things, careful meal planning can help you. So can shopping the sales. 1. First, check what you already have. Now, this may seem like a difficult step, particularly for those folks who love to plan new meals and hit the grocery store. Ahem. But, you need to see what you already have. All too often, we plan a meal, buy the stuff, and then something happens. Something comes up that prevents us from preparing that meal and the ingredients languish in the cupboards. If you’ve got a lot of this going on, then it’s probably time for a pantry challenge where you’ll just eat what you’ve got and shop minimally. Even if that’s not your regular habit, my guess is that you can plan at least one, if not two or three meals based on what you already have on hand. Do this first. Then, see what partial meals you can create from your food storage. What do you need to complete that meal? Add those items to your grocery list. Bonus points if they are typically cheap items or are currently on sale. 2. Scan the reliable sales ads. Next, after you’ve already got several meals planned based on what you have, you can scan the sales flyers. The sales in my neighborhood start on Wednesdays and end the following Tuesday or Wednesday. Each week I receive about half a dozen grocery ads from various stores. I immediately chuck all but two of them. Yes, really. 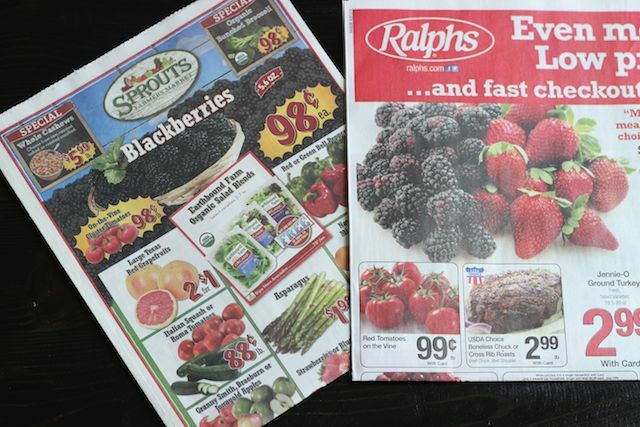 I’ve decided that there are only two shops with weekly sales that I want to frequent: Ralphs (a Kroger affiliate) and Sprouts. Part of this is determined by their location and how well I know and like the stores, but the larger part of my reasoning is based on cost and advertising reliability. I can’t tell you how many times I have gone into their competitors based on the sales flyers and found that the ad really didn’t tell the whole story. Too many times there were limits or small details about the sale that were conveniently left out of the ad. You might not know which of your sales ads are the reliable ones. Trial and error will teach you this. But keep in mind that just because you read it in print, doesn’t make it so. 3. Scan the ads for sale proteins. Now check out the ads for proteins that are on sale. The protein tends to be the more expensive item on the list. I tend to jot down on a sheet of paper the cuts of meat that are on sale at each store and then mark the prices. Next I brainstorm what meals I can make with those. 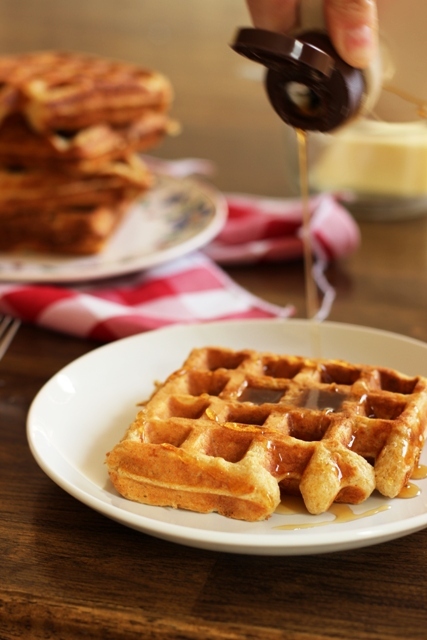 If you need help, go to the top of this page and hover over Main Dishes. A drop down menu will show you all the main dish proteins featured in recipes on this site. You can also do a simple google search or check the database at Yummly, a pretty thorough recipe search engine. 4. Scan the ads for side dish ingredients that are on sale. You should have a list of sale proteins now as well as recipe ideas to go with. You can narrow your choices by matching your main dishes with the side dish ingredients that are on sale. Remember, want what is on sale; don’t just buy what you want. The latter is what got me in big trouble so many years ago. 5. Lastly, build your pantry with sale-priced staples. If you’ve got any grocery money left, stock up on the items that you know you will use in a short amount of time. It’s foolish to pay $5/pound for chicken when it goes on sale for $2. If you’ve got room in the budget, buy a few extra packages to stash in the freezer for farther down the line. You’ll use this little stash to plan meals via step #1 above in the coming weeks and months. 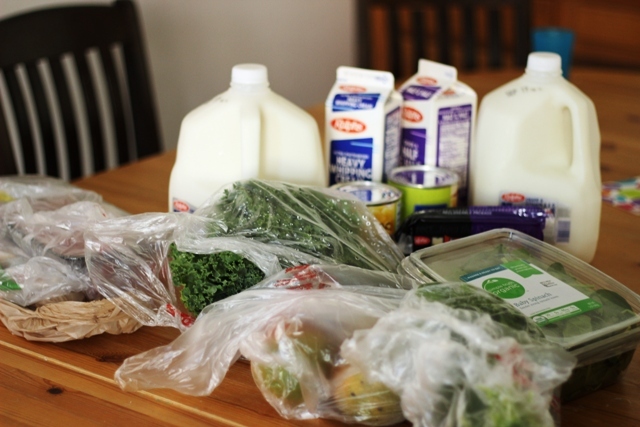 These are some easy steps that you can take to spend less at the grocery store. Granted, there are things on “sale” that aren’t really sale prices. It might be a great deal to get filet mignon for $7.99/pound, but you can get pork chops for a buck ninety-nine. Use discretion as well as restraint when you do your “sale shopping”. Also take note that meatless meals are a great way to save money. You don’t need to buy a ton of proteins. You are getting plenty of nutrition if you’re eating lots of leafy greens, fresh fruits and veggies, and whole grains. While you may need to supplement if you truly go meat-free, you can get by with eating less and saving more money in the process. Lastly, it’s not a sale if you don’t have the money for it or won’t use it. The same goes for the sweater at Ann Taylor as the roast beef at Ralphs. Don’t spend money you don’t have. Don’t buy things you won’t use. Do YOU meal plan from the sales? Did I forget anything? 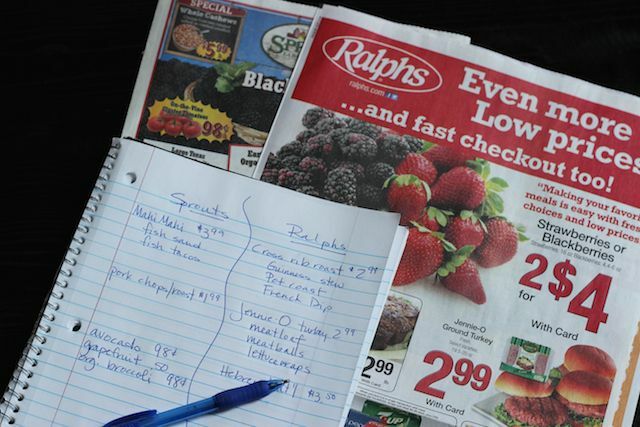 Chime in with your favorite tips for meal planning from the sales. Interested, but need some extra help? There are 40 FREE Printable Meal Plans over on Life as MOM. Complete with grocery lists and meal prep tips, they will help you take a break this week. I don’t have the time or patience for sale shopping any more. I used to be a super couponer/drug store game shopper. Especially once I had kids and we started eating better it wasn’t worth it to hit up the stores with double coupons (too many restrictions and everything non-sale too expensive). I shop a local chain that is employee owned and doesn’t truly have sales. Sometimes you find a random sale, or I have noticed each month one brand of vitamins is BOGO. But the prices are good, we get what we need, and that’s what matters to me. Then we have staples we buy at Sam’s and are able to buy high quality healthy items from Azure. 1. If you’re trying a new recipe, make sure it’s something you think you’d like to eat and not just making it because it’s cheap. If you don’t eat it, there’s no savings. I’m a sucker for new ingredients (Korean spicy bean paste anyone?). I refuse to waste it so I have to use it. 2. What’s the quantity of the dish you’re preparing? There’s only my husband and me, so we end up with leftovers….a lot of leftovers. Thankfully, both of us don’t mind eating them. I’ll usually plan another meal just from leftovers (one dinner or a couple of lunches) and then any remaining amount goes in the freezer for a quick meal or, if it’s a whole cut of meat I try to re-purpose it for another meal . If I accumulate too many freezer meals, the menu for the week is an “Eat the Freezer” week. However, until we bought a standalone freezer, our freezer space was limited so I really committed to eating leftovers within the first week as I had limited space to freeze them. Great tips. Thanks for adding them to the list! I’ve been married for thirty five years and I have always used grocery sales and ads to rule meal planning. I also use coupons, but am not obsessed by them. I have to watch myself for the tendancy to overstock on sale items which is why I love pantry challenge. I laughed at your filet mignon/pork chop example. So true! We buy good steaks once a year-rib eyes on Valentines Day. Our income flucuates due to my husband’s work, so keeping grocery costs down has always been good for our budget. Just yesterday I experienced what you meant by “unreliable ads”. I’d been waiting for pork shoulder roasts to go on sale somewhere so I could cook a roast in the crockpot for some green enchiladas I’ve been craving. Finally Lucky has it on sale for 99 cents a lb this week so I make a special trip over there. I find the pork shoulder next to a sign saying it’s 99 cents but the price on the meat is actually $1.29. I go to the self-checkout and it rings up at $1.29. I call the clerk over and she says it will come off automatically. Nope. So she calls the meat guy who looks and says the .99 price is for whole pork shoulder roasts. I have a half, apparently, it was over 4 lbs, seemed pretty hefty to me. There were no whole roasts left in the bin when I got there, so I didn’t see any difference in sizes. Nowhere in the ad or on the sign did I see the word WHOLE. I bought it anyway but was pretty ticked that they deceived people like that, and I paid about $1.50 more than I’d planned to. Aww, that’s a pain. We bought one of them last week when they were on sale in the flyer for $1.29/lb. Kinda hurt to see the new lower price this week. I’ve learned to wait out meat sales at Lucky, though (except this time! ), because often they’ll have enough stock left over that the price will drop even further the next week. If the ad or the sign didn’t specify, then I think you were well within your rights to ask for the better price. Maybe next time? As I think you’ve mentioned before, Jessica, the flyer sale prices aren’t always excellent deals. I make sure to check the usual price at the store and see whether the sale is a decent discount. Sometimes items will show up in the flyer (especially 2 for $X specials) at only 20 or 30 cents below shelf price. That’s just encouraging you to buy something you wouldn’t have without prompting. If I still want the item for a particular meal, I might get one — but only one, because “2 for $X” almost always means you can get 1 for $1/2X. Near my grocery list I keep a list of foods/ingredients that I know I will use, but want to buy on sale. Right now my list has beef short ribs, tilapia, corn muffin mix, candied ginger, and sourdough bread on it. Then I keep an eye on the sales flyer and check to see whether there are any special discounts on those items while I’m at the store. Yesterday, I got some butter because it was on a decent sale and it had been on that list for a while. It serves to keep those items in the back of my mind when I’m shopping, even if they’re there for a looooooong time, like ground beef was until last week’s big sale. Sounds like you’ve got some great organizing strategies going! Good job! G’day and very interesting article today! As there are limited if any coupons here, there is a lot of junk mail. I know someone who does this on a regular basis and with the amount of petrol they use up in a week, it does not make up for all the wonderful savings they claim. People do what they “have” to do when they “have” to and greatly admire your courage and honestly in how you got so in debt and well done, you have a lot of people worldwide cheering you on! I used to meal plan but have found I’ve gotten somewhat lazy about it! I’m blaming it on having a toddler, being pregnant and all this snow! I have noticed since I go to the store thinking, I’ll make this or this and sort of guess on the rest that we spend more. And we eat out more. Thank you for the reminder that this makes such a difference! I know that at this point in our lives we are much more stable financially and we can do it this way but it seems like such a waste when we could eat just as well for way less! We’ve been eating in this month and it’s been really nice.